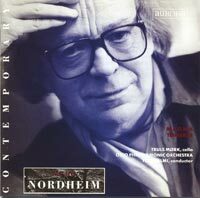 ARNE NORDHEIM (1931-2010): Tenebrae, Magma. Description: Tenebrae was written for Rostropovich, and at least in part this brings out the composer's latent tendencies to derive aspects of his idiom from Soviet-era music, especially Shostakovich. About half-way through, an ironic little march appears (offstage, by the sound of it) and this is then debated within the orchestra and with the soloist, and there are several almost-quotations from Shostakovich's 2nd Cello Concerto and the symphonies. Elsewhere, one hears traces of Mahler and Berg, as well as dissonant, organic flows of chaotic nature-music (with very literal birdsong at one point). This polystylism, while sometimes decidedly confrontational, feels more organic than, say, some of Schnittke's; the impression is of a continuous, tense and concentrated argument that requires divergent vocabularies to make its point. Magma, a the title suggests, explores seismic sonorities as a depiction of inexorable natural processes and perhaps also as a metaphor for other, man-made forces that terrify society. Typically for Nordheim, a tonal batholith is threatened with engulfment by lava-flows of dissonant, clustered fluid texture. Truls Mørk (cello), Oslo Philharmonic Orchestra; Yoav Talmi. Original 2003 release.